Bunker Punks is a roguelike first person shooter by Shane Neville’s one-person studio, Ninja Robot Dinosaur. That’s a bunch of cool words all crammed together. Which is appropriate, because Bunker Punks is crammed with a bunch of cool stuff. William Gibson-esque future where you make runs on corporations gone wild? Check. Randomized pixel art levels that give me my favorite moment in shooters, screaming “what the hell is that? !” as a new enemy barrels down on me from around a dark corner? Awesome. Managing loot and character classes to build a stable of specialized rebels? Sweet. Base-building? (OK I actually hate base-building, but it’s pretty cool here.) Bunker Punks brings the defining elements of several genres together into a strong whole, even for an Early Access game, which comes to Steam March 30th. Players raid floors of corporate offices and R&D labs, facing harder and harder enemies while gathering credits and loot in preparation for a final showdown. Credits are used to build out your bunker between runs. I built an infirmary to increase my characters’ health and a shooting range to improve their weapons skills. In addition, loot— in the relatable form of hats, skate shoes, and hoodies— gives your characters better armor and damage and can be shared between characters at the bunker. The base-building is simple and non-demanding; you don’t come home to a bunch of chores like you would in XCOM, for instance. Upgrades have a tangible effect on your skills that makes managing them feel meaningful, but the simplicity of the upgrade mechanics makes it brisk and satisfying. The game currently contains five characters to play, each with their own skills and clever quips. I’m particularly fond of Cleopatra Rex, who regally demands that enemies make way as she emerges from the elevator with her rifle. The characters’ unique attitudes and one-liners are part of the game’s “punk” aesthetic, and while they weren’t quite the hard-drinking moshpit denizens of my own misguided punk youth, they bring light but clear personality to the game’s world. More punks are promised as the game develops, but I was thrilled to already have more options than the shooter standard of a white guy with brown hair. Though currently light on story elements, the game’s character is also shown through its permadeath feature. You lose your bunker when all your punks die, but you can use tech, another resource you gather, to buy permanent unlockables between games. These introduce different weapons, loot drops, and characters. It’s a system other games have used, but here you buy them from a van in a parking lot. Though more story items will be added as Bunker Punks’ Early Access period goes on, touches like this make it a distinct world. What stood out most to me while playing Bunker Punks was the way the game uses distance and movement. You get the standard FPS weapon types— pistols, shotguns, rocket launchers, and melee options— but where you use them and who you give them to matters. Rifles, for instance, are weak close up but powerful at a distance, especially in Cleopatra’s hands; pistols, often an FPS’ starter weapon, can take down an enemy in one hit if Molly can pull it off point-blank. At the same time, there are enemies that shoot at you or explode upon death, meaning you’re in a bind if you only have a pistol and haven’t unlocked the ability to carry more than one weapon. Waste precious ammo keeping your distance or get up close and hope you have the health to take the hit? Enemies can drop health and ammo upon death, but it disappears after a stressfully short time. This creates a constant tension of advancing, retreating, and picking the right tool for the job. How I played the game felt drastically different with a different character or weapon, and I found myself thinking of proximity to enemies in a way I haven’t in other shooters. The number of times I blew myself up with my own rocket launcher because I shot it off in a hallway is beyond counting, and it was all because I failed to take the necessary, split-second moment to think about where I was. 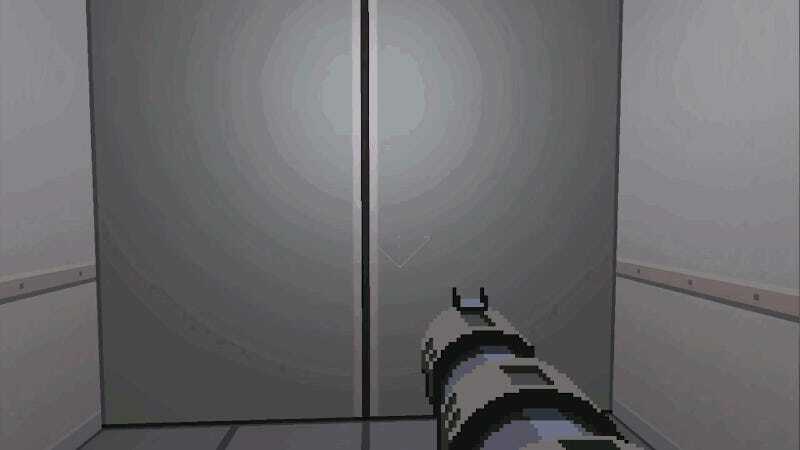 This need to constantly monitor how you’re moving through the game’s corridors reminded of one of my favorite future-corporation-run-amok roguelike shooters, Heavy Bullets, which tasks you with retrieving your bullets after you shoot them. But where Heavy Bullets is methodical and slow, punishing quick or rash actions, Bunker Punks is frantic and fast-paced. The swarming enemies call for constant movement (something I, unhealthily prone to standing still in shooters, am terrible at), but at the same time you want to be strategic about where you move to. You can see me triumph and fail (often fail) at this in the video below. Overall Bunker Punks has a distinct personality and a lot of solid mechanics in place. It’s a game I’ve been excited about since I first randomly saw some screenshots of it on Twitter a year ago, and I’m looking forward to how it grows and changes as its development goes on.